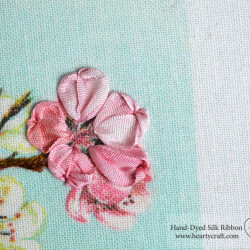 7mm wide Dawn and Baby Pink silk ribbons are great for stitching these flowers. Pale yellow sections of Dawn are used for yellowish flowers and pink sections — for pink ones. 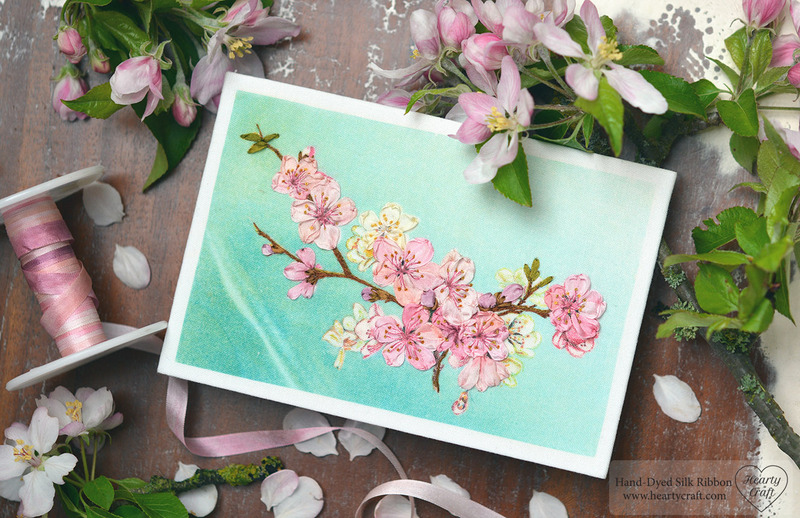 The darkest parts of Baby Pink ribbon are used for buds and the rest for stitching petals. For leaves I picked out 4mm wide Citrus ribbon and for flower calyx — 4mm wide Walnut ribbon. I made all the stitching fairly quickly as I didn’t stitch every flower, only those which are on the foreground. The only thing I got stuck with were stamens. First I made them in dark red, then in brown-red, then in fuchsia pink, and finally they are dusty pink. It was more unpicking than stitching in fact! 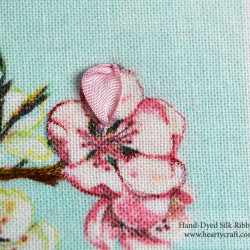 I took a few photos to share how the flowers were stitched. 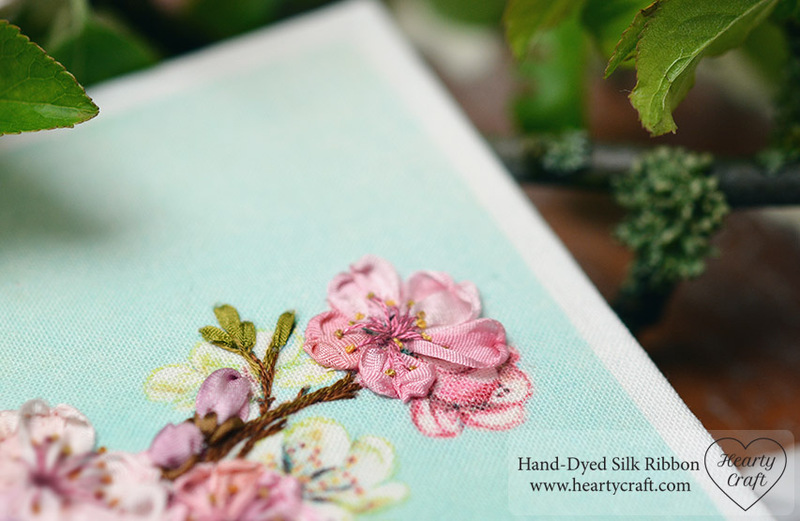 I used left and right sided ribbon stitches to make each petal, but they also can be stitched with a basic ribbon stitch (the tutorial is here). 1. 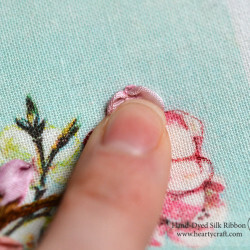 Using a chenille needle mark where the petal starts and ends. Start petals at a distance from the centre of the flower, leave some space for stamens. 2. 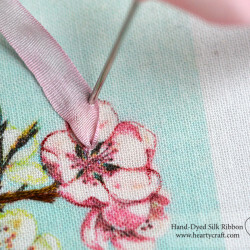 Bring the needle to the front, and lay it onto the fabric as if doing basic ribbon stitch. Then pierce the ribbon close to its right edge to make a right-side ribbon stitch. 3. Pull the ribbon through very gently to form the left part of the petal. 4. Bring the ribbon to the front and make a left-side ribbon stitch in the same manner as the right-side one only piercing the ribbon close to its left edge. 5. Pull the ribbon through. 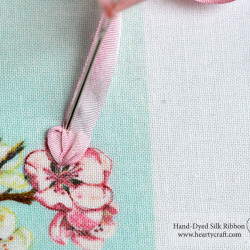 Press the stitch with you finger at the front each time whilst pulling the ribbon to the back. The ribbon will curl along your nail and you’ll get a petal of a rounded shape. 6. Stitch all five petal in the same way. 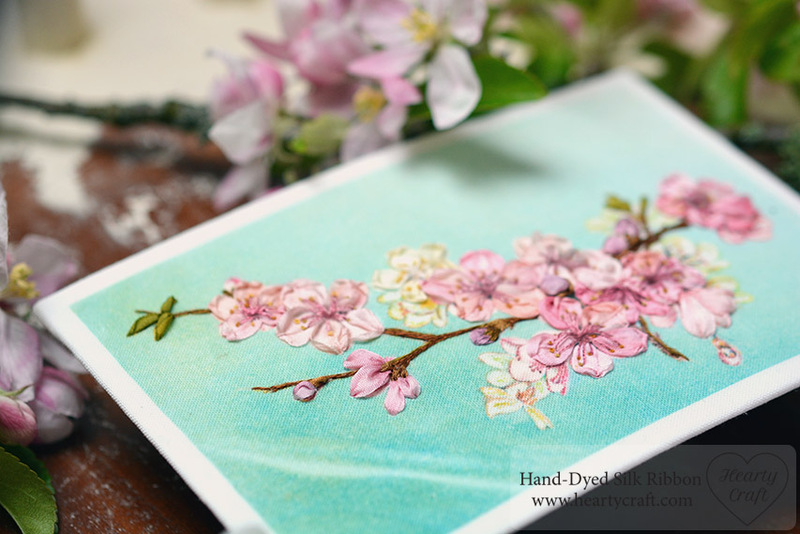 Fill the flower centre with stamens using long straight stitches with one strand of embroidery floss. 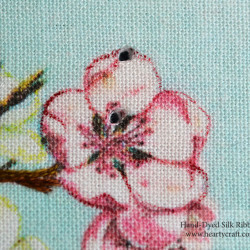 Then finish each stamen with a French knot. If you missed my previous post, you can read more about fabric prints here. You can order fabric backgrounds here. I found your web site and will be ordering silk ribbon from you in a week or so. I really like your tutorials. May I make a suggestion for your web site? I t think you need a “Tutorial” on your menu bar. This will help beginners , like myself, too take advantage of the wonderful information you have already provided. Thank you for sharing this pattern, it is beautiful!